These chips are more like Fritos than Tostitos. And they taste pretty limey. They're sturdy, dip-tastic, and salty as the sea. That's not to imply they're made with sea salt, I just liked the alliteration in the last part of that sentence. Catchy, don't you think? If you've had other lime corn chips and wished they had just a bit more than a hint of lime, you might wanna check these out. The liminess isn't overwhelming. It's just right in my opinion. If they overdid it with anything, it was the salt. From this point forward, I demand that all chips be created to feature a scoop or shovel design. I shall not purchase a bag of chips until you comply with my demands. You hear that, Archer Farms corporate guys? NOT A SINGLE BAG OF CHIPS! If you're with me on this, leave a comment below letting me know you'll sign the petition. Practical chip fans unite! We'll see how that goes over with the big Target gurus. I'm sure they'll cave any day now and announce that they'll only sell scoop-shaped chips at Target stores. But at any rate, I'm quite impressed with these chips. 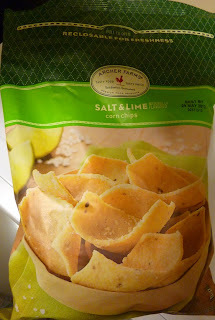 If you like a little cornmeal with your lime and salt, check them out. No, really, I guess I'm exaggerating a little. There's a pretty good balance of all the flavors present—and again, I can't recommend them enough with a fruit-based salsa. I give this product 8 out of 10 stars.